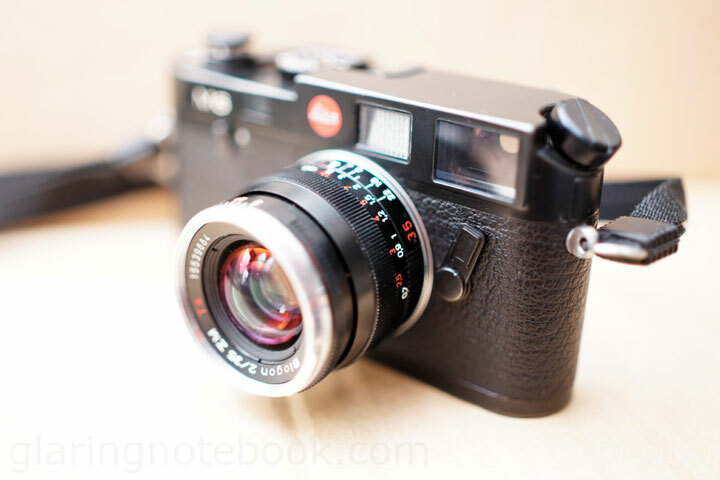 And now, for pictures of the Leica M6 TTL! 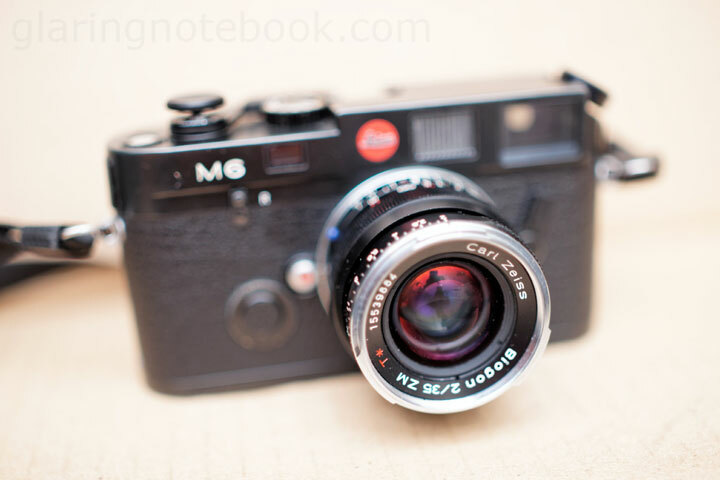 Mounted on it was the Carl Zeiss Biogon T* 35mm F2.0 ZM. The back. The ISO is also set here. Strange that they’d say ISO and not ASA. There was also a PC Sync port below the flash hotshoe – note that in this case, PC Sync stands for Proctor Compur Sync (cable). You’d remove the film by removing the bottom plate, and opening the back plate. 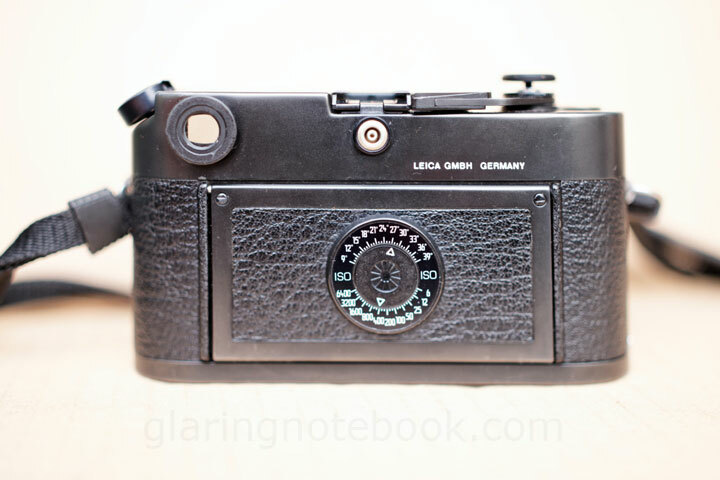 A problem with rangefinders is that you can cover your lens and take a picture, and not know it! 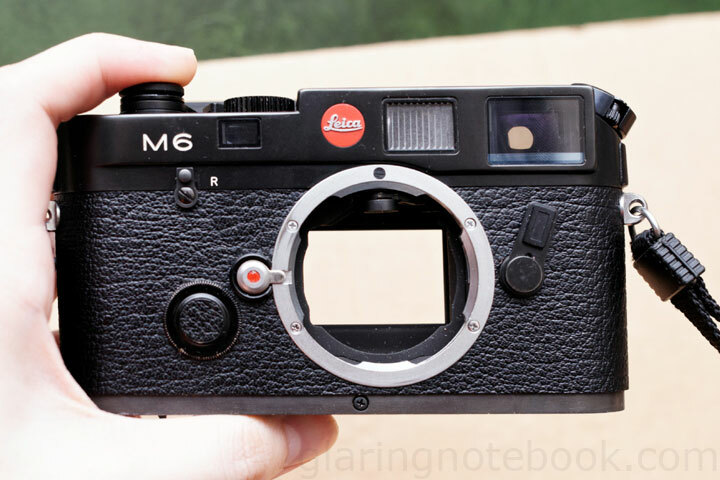 Since you’re not looking through the lens, but through a separate window, there is also the issue of parallax – but the M6 cleverly adjusts for this by moving the framelines as you focus closers. 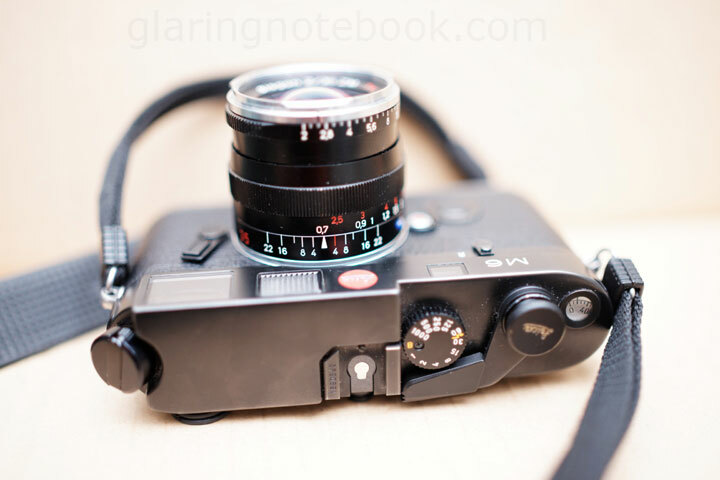 Because of this parallax issue as well, I reckon, there is a limit of how close rangefinder lenses can focus. 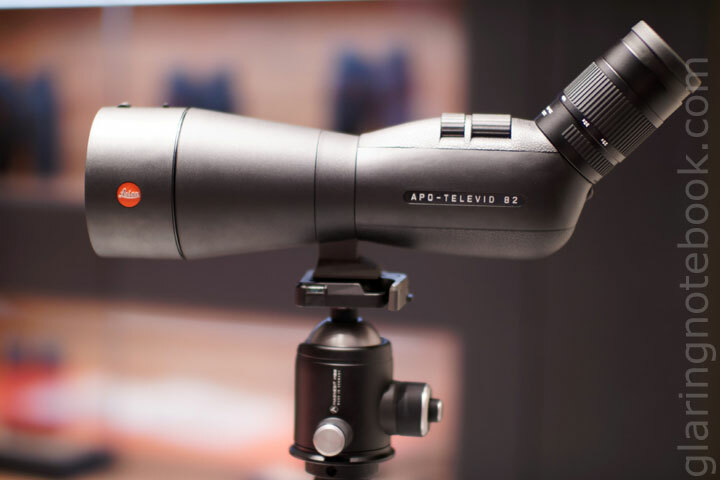 This lens goes to 0.7 meters close. 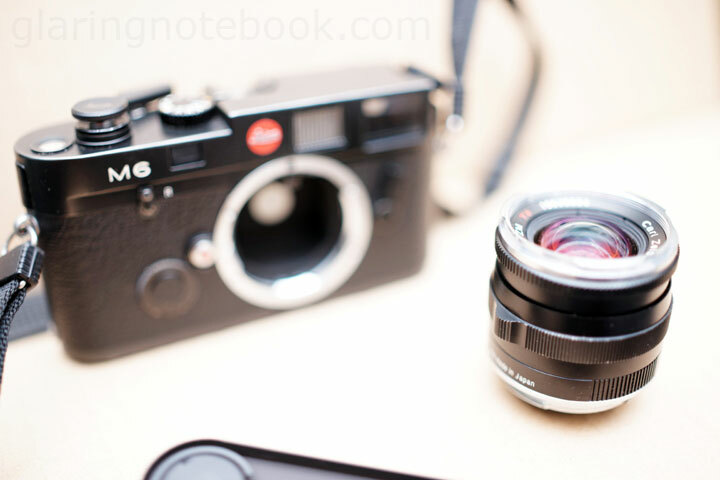 Of course, there are some lenses that do focus closer, but often with an extra attachment. 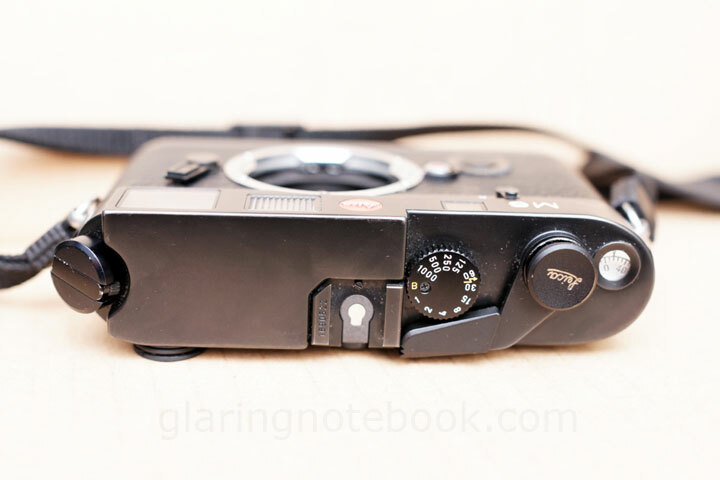 Another interesting usability element in rangefinder lenses, is that they often have a knob for your thumb – so you could quickly focus to a certain distance by feel, by adjusting the knob to a known position. 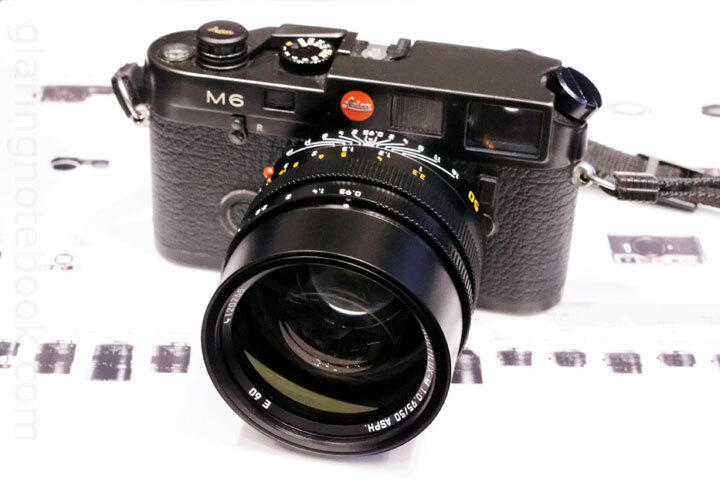 A cheaper option to going digital with a Leica M-mount system would be to buy an adapter to a mirrorless camera system, like the Sony Alpha NEX system. On the left is the Sony Alpha NEX-5 with the Kipon M-mount to E-mount converter. 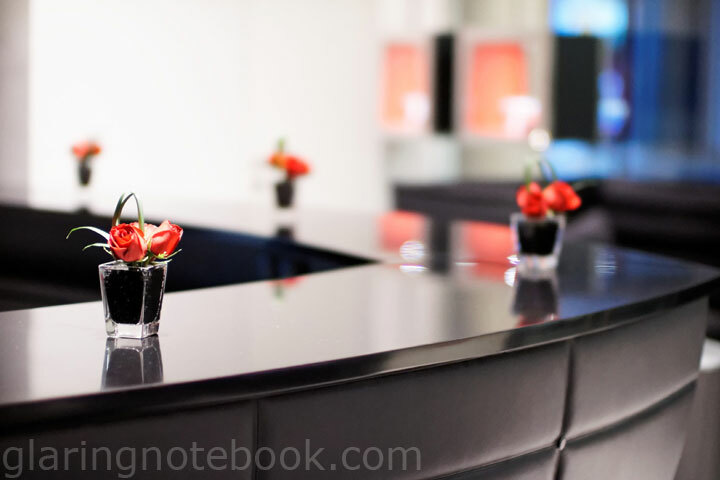 The only thing you lose is a wide angle of view, since the NEX-5 has a 1.5x crop factor. 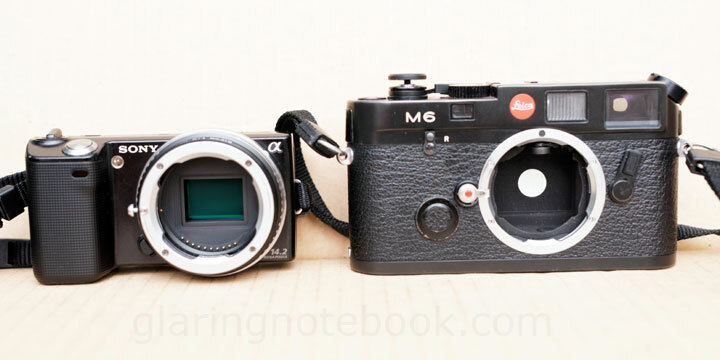 Thus the angle of view of the 35mm on the M6 becomes like 52.5mm on the NEX-5. 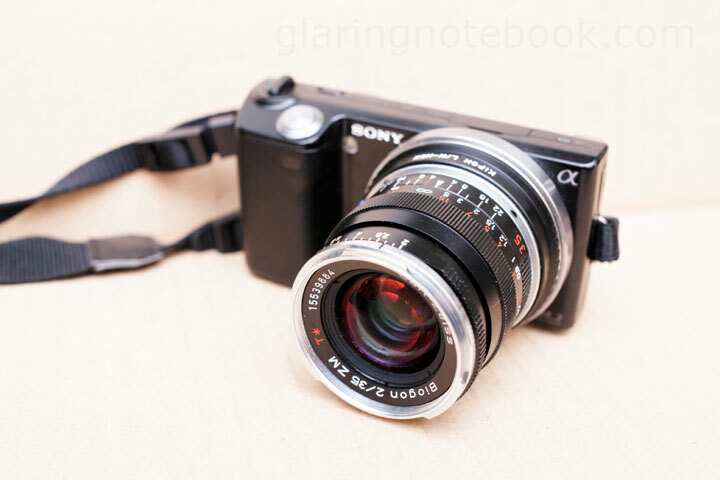 Same lens, this time on the NEX-5. Very much possible this way due to the shorter flange distance of 18mm. 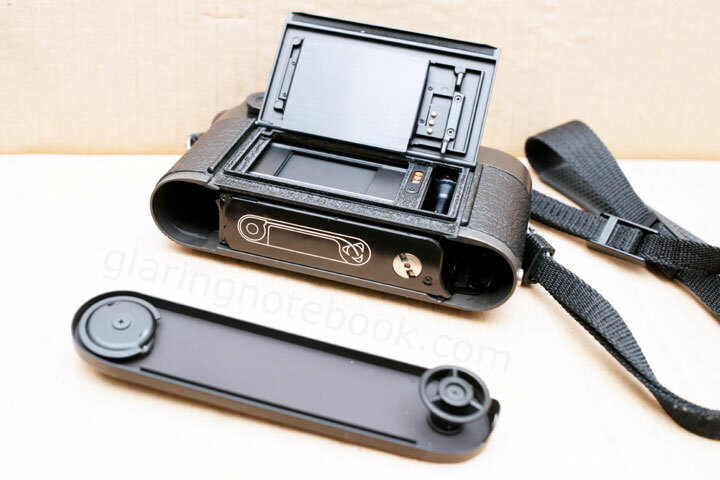 A lens mount that has a bigger flange distance (distance from lens mount to sensor/film plane) than the lens being mounted, needs an adapter that has glass, to retain the ability to focus the lens to infinity. Of course, without the glass, it may become a macro-only lens! This is why you don’t see M-mount lenses being mounted on my A900, for example. The other thing about these adapters with glass, is that the optical quality degrades and it is in fact a teleconverter, so you lose light and get a narrower angle of view. 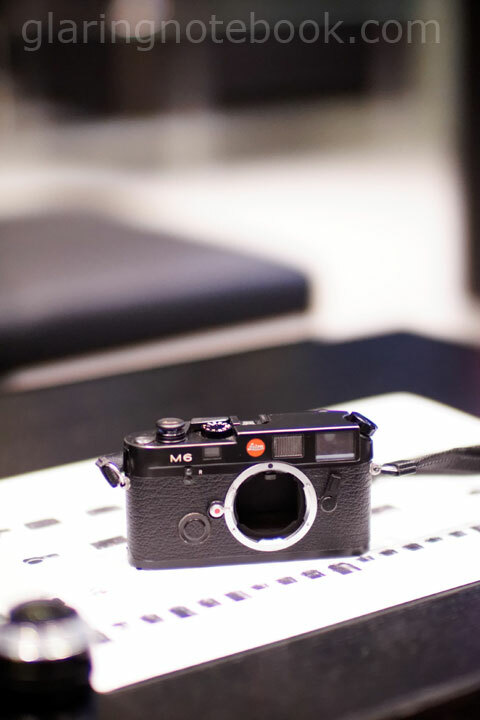 Anyway, this is the Leica Noctilux-M 50mm F0.95 ASPH at the Leica Global Store at Avenue K.
This picture, and all pictures that follow, were shot wide open at F0.95. 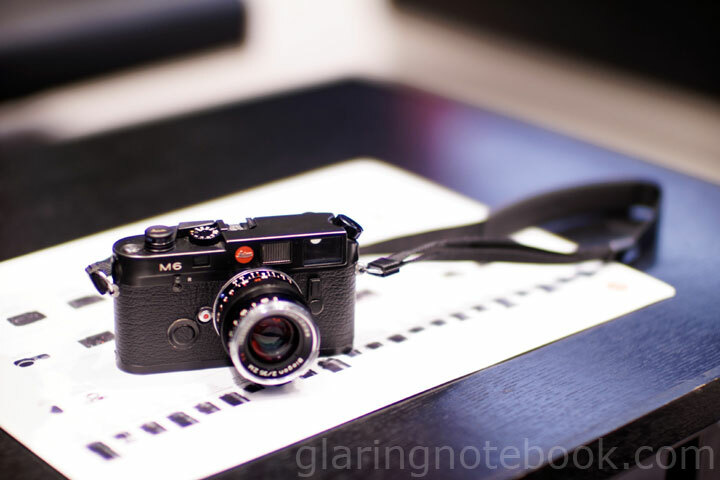 I mounted it on the NEX-5 with the Kipon M-to-E-mount adapter. Of course, I’d rather test such lenses with portraits. 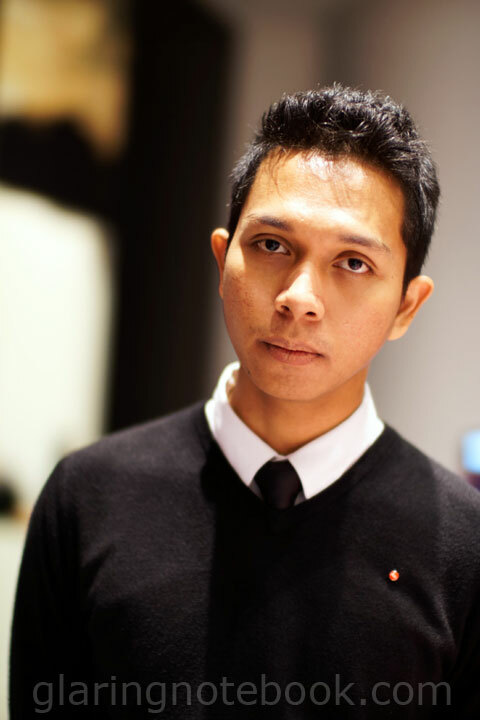 This entry was posted in Geek, Pictures on January 2, 2012 by 2konbla.